Trump says he “knows the tax code better than anyone.” He should release his tax returns then! 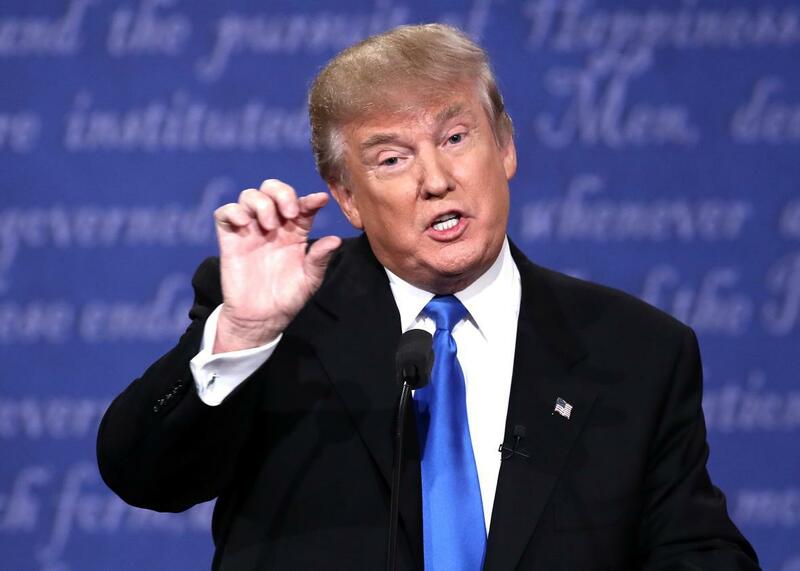 Approximately how much Donald Trump pays in taxes. The fact that Trump, a self-proclaimed billionaire, could have paid nothing in taxes for nearly 20 years, should offend the many working-class folks he counts among his supporters: After all, they’re paying their taxes and struggling to get by while he’s raked in fortunes and quite likely paid nothing. Mitt Romney was reportedly nervous that his tax rate was too low and declined to take all the charitable deductions he was entitled to in order to show a higher tax rate. But Trump doesn’t seem to fret over that kind of bad look, as a couple of his interjections in the first presidential debate made clear. His response to the Times suggests he believes his avoidance of taxes may actually appeal to voters—that they admire his success in reducing his taxes, even if it means they have to pick up the slack. If that’s really becoming part of his pitch, then there’s a great way to bolster it: release his tax returns. To be clear, Trump may have done nothing untoward with his 1995 tax return and it may be entirely proper for him to have paid no taxes, even over so long a period. If he actually lost $920 million, then he’s entitled to the deduction and to use it to offset future income. Imagine that you lost $150 in Year 1 and then earned $50 in Year 2. Overall, you’ve lost $100 and would be pretty unhappy if you had to pay tax on the $50 gain in Year 2. To account for this, tax law allows you to carry the loss forward and use it to offset future gains, aligning your tax results with your economic reality. There’s nothing nefarious about that. That leads to the $920 million question. Do those losses represent actual money Trump lost? Or do they represent paper losses he was able to claim because of the way the tax code works? The code is replete with special benefits for real estate, and the campaign’s suggestion that he knows his way around the tax code suggests that it may be the latter. But we’ll never know unless he releases his full tax returns, which he still refuses to do. Trump’s tax proposals seem to hinge, at least implicitly, on the proposition that it takes a thief to catch one. That is, he’s manipulated the tax code to his advantage for years and therefore knows how to fix it. (On Sunday, Trump surrogates even argued that the Times report shows that Trump is a “genius” with taxes.) However, he’s been silent regarding just what precisely he has done with his own filings, and offered few details regarding what he would change about everyone else’s. Releasing his tax returns would reveal the extent and nature of his tax planning, so that voters could at least assess his claims. Releasing the returns would also help us get to the bottom of the questions about his foundation, which I have discussed previously. Did he report the income he earned and apparently directed be paid to his foundation? Did he report as income the money the foundation has allegedly spent on his behalf? One of the questions is whether Trump understood that using foundation funds for personal purposes was prohibited, supporting a referral to the Justice Department for a criminal investigation. The campaign’s claims that “Mr. Trump knows the tax code far better than anyone who has ever run for President” certainly supports that inference. The release of three pages from Trump’s 1995 tax returns confirm what many suspected, that he likely paid little or no taxes for many years. Left unanswered is the question of how. Did he take advantage of favorable tax provisions? Did he use sophisticated tax planning that pushed the envelope? Did he actually lose $920 million? Trump is asking us to trust him with the reins of power. Trump’s business acumen is central to his campaign. To date, we’ve been left to speculate about what is hiding in his returns. He should trust us by releasing his full tax returns, as presidential candidates have done for the past 40 years, so that we can make an informed decision.